The timeliest dog book in years! Released July 5th, it’s accurately subtitled “What Your Pets Wish You Knew About Pet Food.” The author addresses the recent pet food debacle from a non-hysterical position, providing easy solutions to providing healthy, natural food for your pets. Joan Weiskopf attended Tufts University School of Veterinary Medicine, and is a show dog breeder and handler. She’s also a realist who knows cooking for your pet could be time-consuming or complicated. Joan gives the reader easy recipes, prepare-ahead tips and objective info on commercial pet foods. Best foods for your breed are especially interesting but recipes for pets with life-threatening disease are, like the special feline kidney disease diet, invaluable! One wonders why they are so rarely covered in pet literature. Try this recipe from the book. Adjust portion for your dog’s size. This is 2 servings for a 20 pound dog. You probably have the ingredients on hand. How hard is that? But remember, just as you and I like variety, dogs do too! 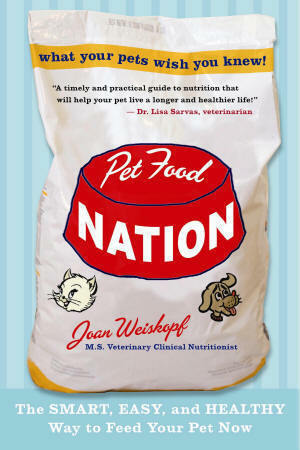 Order PET FOOD NATION from Amazon because the book provides do-able solutions. The readable font size and “digestible” information guarantee this book a place in every pet owner’s library – or kitchen! Let our readers know which recipes you like best or send us your favorite dog food recipe to Editor@TheDogPlace.org.